Want to stitch a free mini quilt with me? You may have already seen the first pattern in this yearlong free embroidery stitching club. If you haven't, jump back and check it out. There's something so charming about shelves lined with, well, almost anything when they are cute and color coordinated. But I thought that it would be especially adorable if I were to take all the Jam of the Month Club embroidery patterns I'm making this year and place them on EPP shelves in the form of a mini quilt. The printable templates have all the pieces you see in the graphic. I'm not including full piecing instructions, because it's pretty easy to follow the diagram. 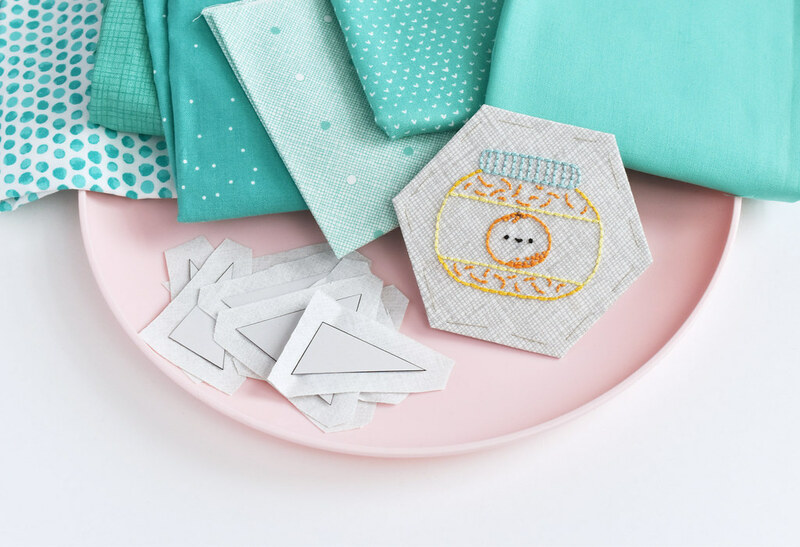 If you're new to English paper piecing, I have a few tutorials around on my blog, plus the stitching clubs in my shop have full photo tutorials. I'm using a light gray crosshatch fabric for my embroidered hexagons and the triangle pieces (basically the back of the shelves). For the shelves and the sides, I'm using the mix of aqua fabrics in the photo above. All the colors in the embroidery will be light, bright, and kawaii. You can use any colors you like, but to get the shelf effect, it'll work best to have similar colors for all the shelves/sides, and for each shelf backing. You could even change the color for each shelf backing, but keep in mind that you're stitching over these. This is my big quilty project for 2019. I can't wait to see this come together. Both for me and for you! Be sure to tag your photos #wildolivestitchingclub. Questions? Leave me a comment or reach out via email or social media! This is so darling! Plan on joining on the first of Feb...payday 😁 please tell me what an EEP is? Thanks. EPP is english paper piecing. 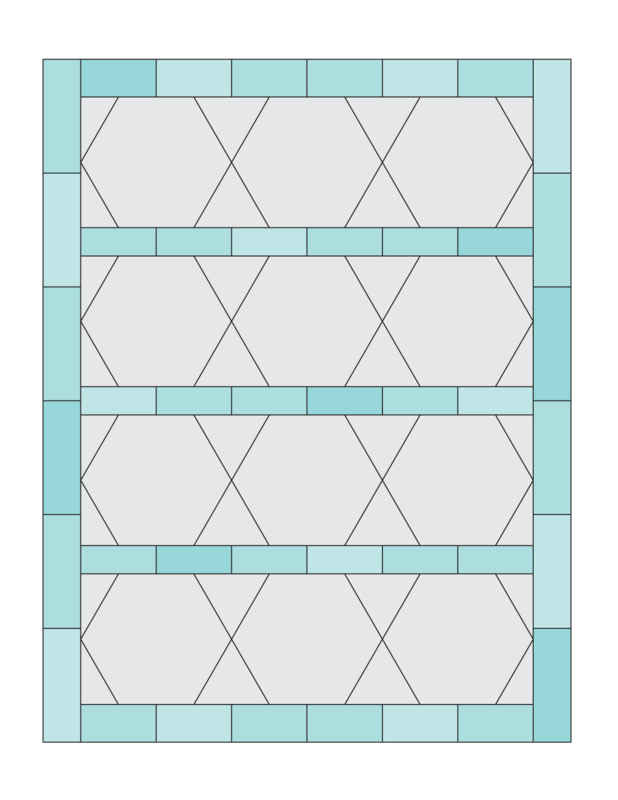 It's a method of hand quilting where you wrap the fabric around paper templates. It helps make things accurate and easy. Un hermoso proyecto. Gracias por compartir! Tengo una pregunta: En el PDF aparecen dos frasquitos de mermelada. Hay que bordar dos para este proyecto? En el PDF, Mollie a provisto dos imágenes del frasquito de mermelada, una al derecho y la otra al reverso. Para que podamos escoger la que más nos guste, y poder utilizar cualquier método de transferencia. Solo bordarías una, la que prefieras. Gracias Bits of Stitching! Sí, solo necesitas coser uno de los patrones. Lo incluí regularmente y revertí según el método de transferencia que utilices. Are you using the same blue fabrics throughout the entire quilt or are you using different fabrics for each month. Love the idea. I'll be using the same blue fabrics around the quilt and for the shelves, as well as the same gray for the background. That way it frames things and looks more like a little shelf. This looks like lots of fun!!! Very sweet of you to host this EPP SAL on your blog! It brings back sweet memories of stitching the seasonal stitching clubs. In fact, I’ll have to get again from your shop another Winter Stitching Club because my old desktop is dead, and I did away with my old email. Just email me and I'll take care of it for you. How many strands did you use? I used three strands for the entire design.